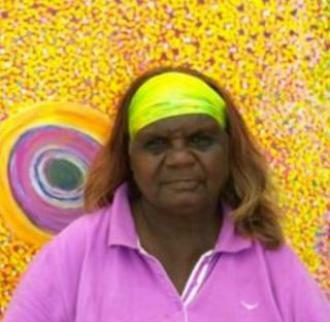 My name is Phyllis Waye and I’m a Wongi woman from the Goldfields in Laverton W.A, though I was born between Laverton and Lenora station at a place called Jindalbe. I have three sisters and two brothers, mum and dad used to take us hunting and taught us how to live off the land. I left home and married a Walmajarri man. I live in Bayulu community near Fitzroy Crossing. I have one daughter and three sons and I paint at Mangkaja Arts Centre. I tell them my stories and they write them down so the Kartiya (white people) know where I come from. I like to share these stories. I paint my mothers and fathers country as well as my grandfathers and grandmothers country from stories they have told me. I paint this country to bring back memories from when we were kids growing up in the desert. I paint this country and the waterholes where my people lived many years ago. We used to hunt for food out in the desert, in that Goldfields country.